Landscape – Everything is Oll Korrect! This is another difficult episode to discuss, so again, let’s go through scene by scene. Our voice-over is back, which gives a sense of, perhaps not quite a return to normalcy, but at least that things are winding down. 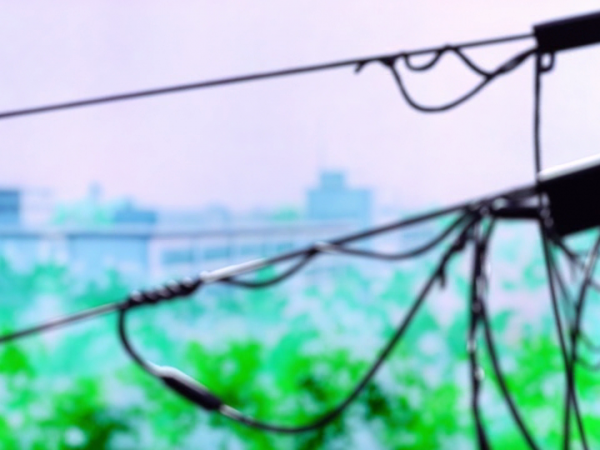 Reinforcing this, the title screen gives us a view of clouds, followed by utility poles with, of all things, a green background, giving us a rare glimpes of the natural world. It’s quite calming to see some natural scenery compared to lain’s more typical cyberpunk aesthetic. Lain has turned into quite the extrovert, but it’s such a departure from her normal personality that it feels disturbingly artificial. Alice is more of a realist than Lain, not open to her suggestion to just “rewrite bad memories,” but we’ll get to that later. I don’t know how much we should take from the scene in Cyberia with Taro basically ignoring his friends. It seems that he and whoever he’s speaking to have figured out who Lain is. What stood out to me more is Myu-Myu’s defeated expression. She’s a very minor character, but small touches like this giving side characters some life make the world of any story seems larger and more real. After this is a newscast announcing that “Protocol Seven is expected to allow the seamless sharing of information between the Wired and the real world.” We knew that, but then the newscaster starts a mad chant of “Let’s all love Lain!” She’s apparently become quite the celebrity, but this is a rather creepy and artificial sort of love, to put it mildly. Despite Mr. Iwakura’s assurance that Lain isn’t alone, this isn’t exactly the best company. Eiri’s speech largely wraps up his materialistic view of the world and his stated goal (though certainly not his only goal) of fostering human evolution, which we’ve touched on previously. We do learn in the next scene, thanks to Karl, that Eiri has been working with Tachibana, or at least the boss we’d seen previously. What exactly he’s been up to remains ambiguous. Perhaps he’d been working on his own, or perhaps we’ve been misled about the contrary goals of Tachibana and the Knights. Either way, I don’t think I have enough information to offer a solid conclusion, nor am I sure why the MIBs are killed by Lain, or at least the figure of Lain – perhaps they’re among the only ones who both know what’s going on with Protocol 7 and may have some chance of stopping it, and so must be eliminated for the plan to succeed. The scene of Alice entering Lain’s house is another favourite of mine. 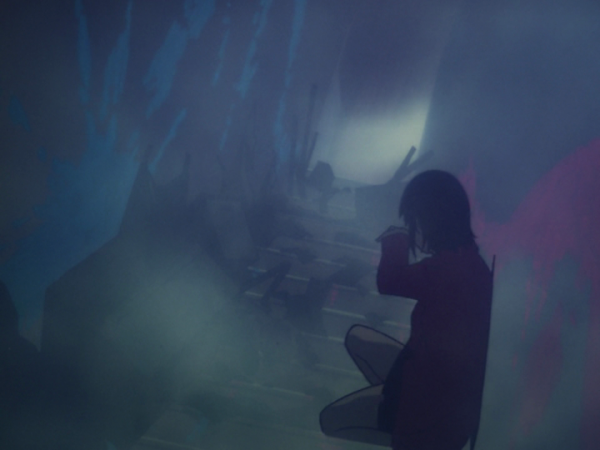 Visually, lain is at its best when it resembles a horror film, and one has to give her credit both for her courage and her politeness in removing her shoes at the entry way, even though the whole house is obviously trashed. The house is, as far as I can tell, in the real world, though there don’t appear to be any real people living there. Even the broken Mika vanishes after just a glimpse; my guess is that her apparition is some kind of residual data since her parents are both entirely gone. Now, Alice’s conversation with Lain. Her concern isn’t so much Lain’s tampering with memories, though she is bothered by it, but with why she had Alice alone remember them. Some people would likely be more freaked out that Lain was able to rewrite memories at all, but that ability is so strange that it’s difficult to grasp; what’s easier to grasp is how this affected Alice in particular, so, in keeping with Alice’s role as the down-to-earth foil to Lain’s world of abstractions this is what troubles her the most. Everyone else has happily forgotten about Alice’s problems – but Alice must live with these bad memories. Lain doesn’t explicitly explain why she did this; rather, she immediately starts talking about “connecting” people and so on. Perhaps, having apparently internalised much of Eiri’s thought (she refers to herself and everyone else as “applications” who don’t need bodies, though she objected to Eiri doing so last episode), she saw it as a positive, friendly thing to share what she could do with Alice, and that of course it would be better to know something (share information) than not to know it. That seems to contradict her earlier message to Alice about rewriting bad memories, but it could be that Lain was mostly thinking of rewriting other people’s memories. Lain herself would remain omniscient, and share a part of that with Alice. 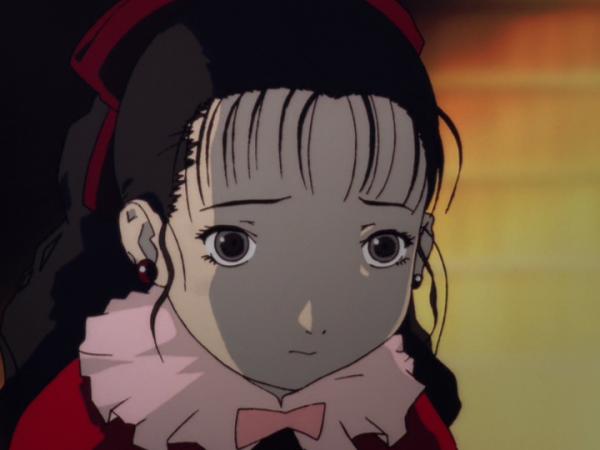 In any case, Alice may not follow what Lain’s talking about, but senses intuitively that it’s wrong. 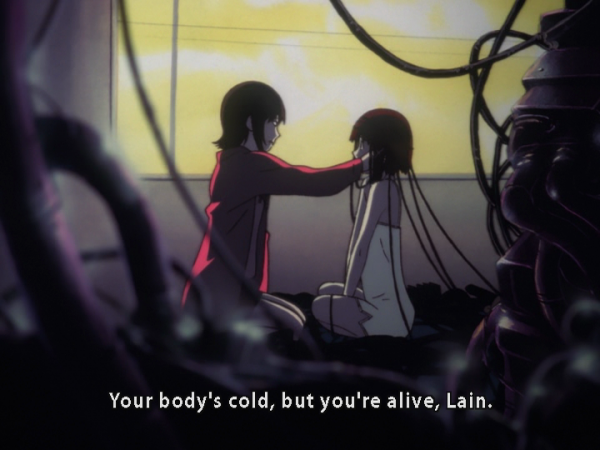 Then, like in Layer 06, she touches Lain – putting her hand on her face, then putting Lain’s hand over her chest to feel her heart beating. Alice doesn’t, and probably can’t, explain what she knows intuitively, but her main point is essentially that we aren’t just abstract intelligences that happen to be tied to a body. Her emotions, at the moment largely fear, are real, and her body reflects that via a raised heart rate. Our interior life and our physical bodies are tied together, and both are important. This seems to bring about another change in Lain, and in her final conversation with Eiri she questions his knowledge and power, and adds “With no body, you can’t understand.” What happens next confused me for a long time, but my current theory (based on Frontier’s comment on this post) is that Eiri, enraged at the suggestion that there may be a god outside of the Wired greater than him, attempts to manifest physically, giving Lain a chance to destroy him. We’ll get into this more, though, in the conclusion next week.